As you may remember from my hair care routine video, I've been on a bit of a hair tangent lately. 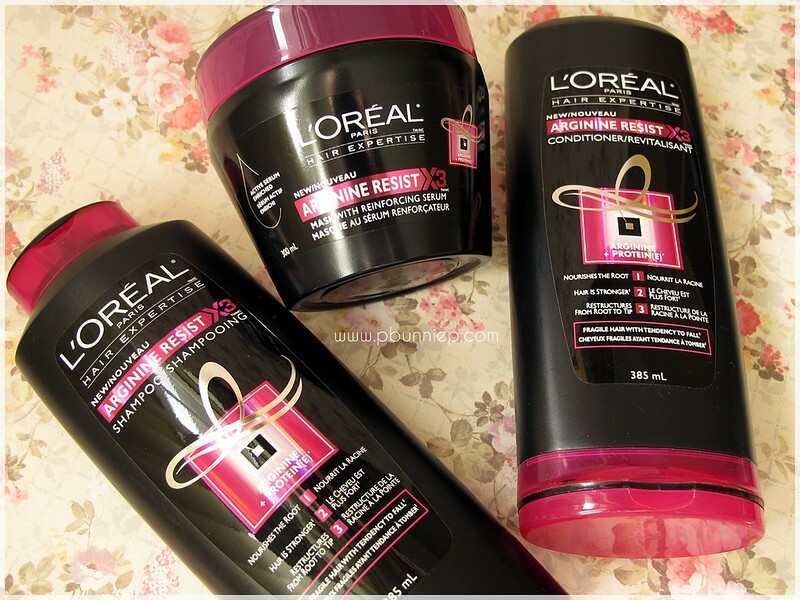 Setting aside my faithful Joico K-Pak, I decided to try out a new line by L'Oreal Paris. The Arginine Resist line had me hooked from the very first look, maybe it was J.Lo swishing her hair around, maybe it was the sleek packaging (which by the way is nothing like the designs I'm usually attracted to either) or maybe it's this new thing called "arginine" which sounded uber fancy. Whatever the reason, I found my self at the haircare aisle taking home 3 of the 5 products in the entire range. Range: Shampoo, conditioner, mask, treatment spray. Price: $4-6 each (regular price), $2.99 when on sale! Would I repurchase: Surprisingly, yes. 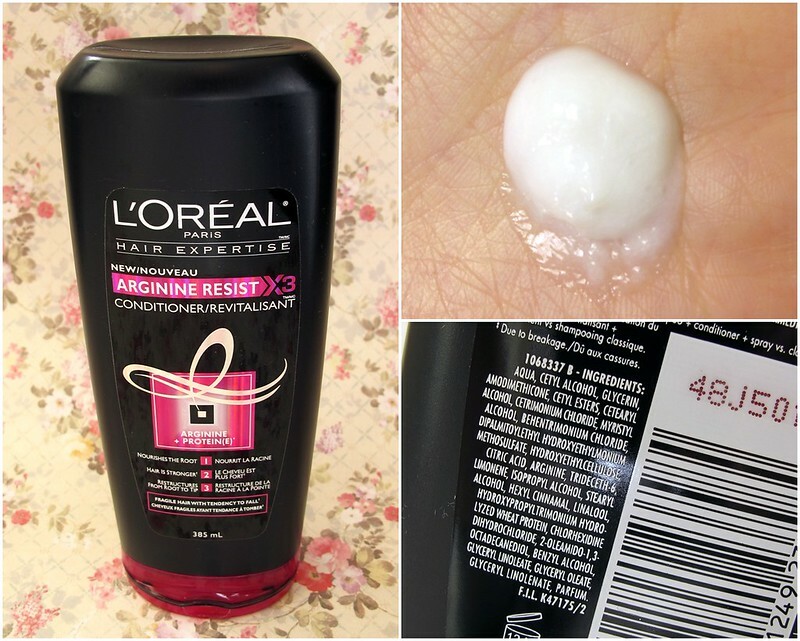 Let's get one thing straight first, in all my years of dabbling in beauty products I've never had great luck with L'Oreal products, especially their haircare. Of the ones that I've used, they've all left me quite unimpressed. A few were mediocre and a others were just down right terrible. So although I was eager to test out this new arginine line, I couldn't help but be a little apprehensive too. I'm currently in the process of growing out my hair (again) and thought something like this, which is created for those seeking to prevent hair loss, might give me an extra boost. 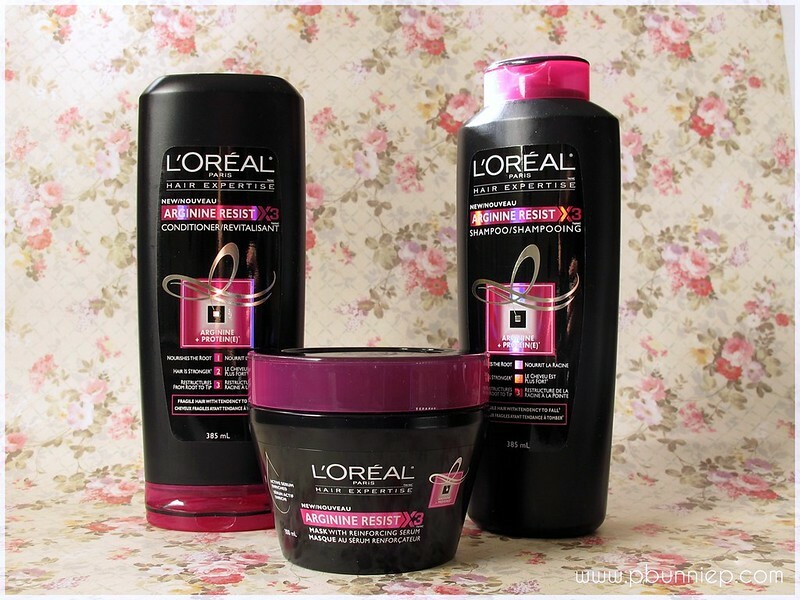 The star of this whole range is arginine which L'Oreal explains below.
" Arginine: A key ingredient essential for your hair. First step, the shampoo. It starts out a milky pearly liquid and foams up decently to a medium lather with a mild fragrance. I prefer to use this with a shampoo massage brush for maximum clarifying impact and work together quite nicely. If you're seeking that squeaky clean (Head and Shoulders) feeling then this may not impress you as its not a high foaming clarifying shampoo. The good side is that is leaves my hair smooth and detangled right after I rinse it out which is a rare instance for my long hair. Wash, rinse and repeat. Then I slather on the conditioner which is surprisingly lightweight for what I thought it would be. I can take this all the up close to my roots without leaving a greasy feeling which is again surprising because I can't do this with most other products. As I'm rinsing out the conditioner, I notice that most of it has absorbed into my hair instead of running down the drain which is a good sign. The final result is hair that's nicely balanced! Having oily roots and dry ends, I usually have to choose one side and compensate for the other but it seems that the Arginine Resist line has found a nice medium between the two extremes. 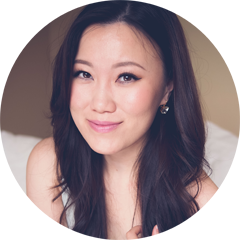 On a day to day basis this left me with hair that is smoother overall and easy to manage by just air drying even without any additional styling product. Once a week I'll also treat myself to the hair mask by leaving it in my shampoo cleaned hair for about an hour. A quick tip, towel dry your hair before putting this on as it's got quite a fluid consistency and may drip if mixed with wet hair. The mask is probably my favourite from the line because of how nourishing it is without the feeling of a silicone coating that most treatments tend to leave behind. 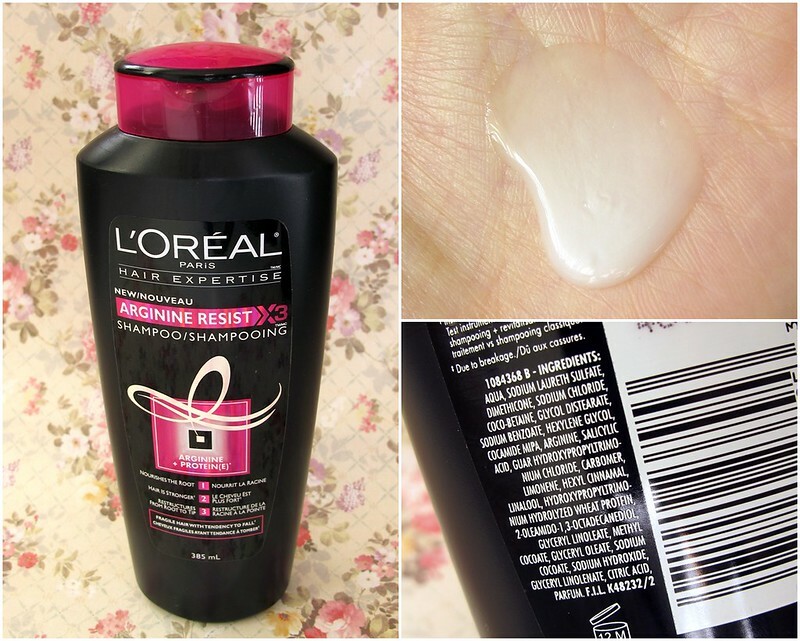 Altogether this was a wonderful surprise and it's something I can see myself repurchasing in the future which is a first for me in terms of a L'oreal haircare product. It's certainly not the most intensive and moisturizing line I've encountered but after more than a month of use it's left my strands more managable and feeling more balanced from root to tip...and dare I say I think my ponytail has become a bit thicker as well. Try this if you're looking for a daily nourishing and smoothing haircare line for dry-normal-slightly oily hair. Those with super dry, fried, dyed hair should probably stick to the Joico or Moroccan Oil. Oh and put down that Reinforcing leave-in spray from the line, it contains way too much alcohol to be good for your hair. You've convinced me alright, I need to buy a new shampoo soon as I'm almost out. Hoping I can grow more hair with this. 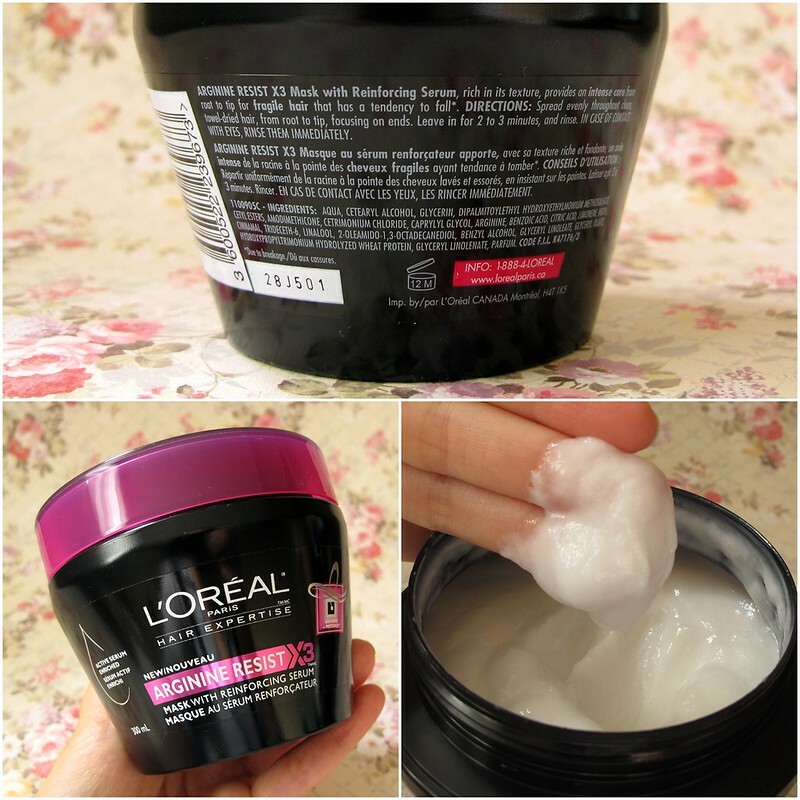 This is the best one I've used from L'oreal for a long time. They've been putting out quite a few new lines/products recently. Hopefully they are improving their brand! ok im doing this! btw... im going to be in van this break.. would you have time to meet up? i've love to see you!!! 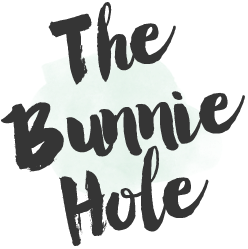 Thanks for your review and I am definitely going to give this a try! I am already taking an arginine supplement and have been extremely happy with the results so I love the idea that there's a hair products with this ingredient in it too.